Priced: $42.25 - $65.00 Rated: - 4 stars out of 5 by 8 reviews. The North Face Women's Jester is equipped to handle the school year with ease. FlexVent injection-molded shoulder straps and a foam back panel keep the ladies comfortable as they journey from class to class, or if they are out on the trail during the weekend. A large main compartment fits books and binders, and there's room for organization in the secondary compartment. Mesh side water bottle pockets make sure this 27-liter women's pack made by The North Face is keeping up with your education, and your fun. FEATURES of The North Face Women's Jester. SPECIFICATIONS of The North Face Women's Jester. The North Face Jester Daypack for Women Features. 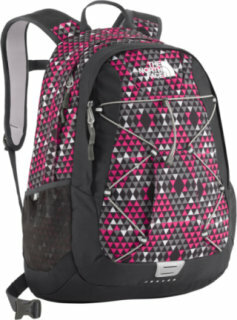 The North Face Jester Daypack for Women. The North Face Jester Daypack for Women is the ideal gear to have on a day trip. This spacious pack has been specifically designed to complement a woman's smaller frame. It has FlexVent injection-molded shoulder straps, to cut the stress on your shoulders and give you best comfort. Its chemise foam back panel offers great support and is non-abrasive against exposed skin. The pack also has two large zip compartments that can hold items like books and binders. The front accessory zip pocket, with an internal sleeve, is handy for storing smaller items. You can strap extra gear or clothing, using the external bungee cord that's been provided. Additionally, the side mesh pockets allow easy access to water bottles or snacks. Put on the North Face Jester Daypack for Women and you're ready to take on the outdoors. The North Face W Jester Backpack is a coveted daypack, now designed specifically for women, with a female proportioned back panel and shoulder straps. Versatile 27-liter design provides ample space for varied uses. Two large zip compartments and exterior bungee system at pack's face for additional storage. An easy carry for women - making travel, hiking, across campus or just having your needs with you when ever you want, a no brainer process. The Jester Backpack by The North Face is an incredibly durable and versatile daypack. It holds up to 27 liters of volume and has two large zippered compartments. The front zip pocket has built-in sleeves for excellent organization. Bungee cords on the pack's face provide excellent easy-access storage for additional items. The comfortable shoulder straps have a top layer of Atilon foam along with an injection-molded shape. Other features include mesh side water bottle pockets, a comfortable foam pack panel and a removable hip belt. The women-specific FlexVent™ injection-molded shoulder straps on The North Face's Women's Jester Pack make carrying the day's books or gear a breeze. Stitched-foam back panel is soft and comfortable. Removable hip belt and sternum strap distribute weight evenly. Large main compartment has a padded laptop sleeve and hydration port to keep you organized. Secondary compartment stores accessories. Mesh side and water-bottle pockets. 600- and 1,200-denier polyester. Imported. Overall: 18-1/2”H x 13-1/2”W x 8”D. Laptop sleeve: 16-1/2"H x 10-1/2"W x 1-3/4D". Lug around your school essentials in comfort and style with The North Face Women's Jester Backpack. Its women-specific fit and support provides a comfortable pack you won't mind slugging over your shoulders when your on your way to class or to the trailhead. You aren’t a fool, so don’t carry your gear like one. With The North Face Jester Backpack you’ll always play it smart. Designed with one large main compartment that’s able to fit a couple of dictionaries, this versatile pack also includes a front accessory zip pocket with an internal organization sleeve to stash smaller items. Plus, it’s now specifically designed for women meaning that those days of back pain are now over. It's not time to joke around! The Jester by The North Face® isn't a fool, it's a serious daypack that only wants to do its job! FlexVent™ injection-molded shoulder straps with a top layer of Atilon foam for added support and bottom layer of PE foam for added comfort. , stitched foam back panel. for added load management options. Spacious main compartment for all your daily essentials. Front pocket features an organizing panel. Bungee cord on the front panel offers immediate storage. Zip closures with sturdy zipper pulls. No one will call you a fool with the North Face Jester Backpack on your back. Designed with two large zip compartments, this versatile 27-liter pack features a front accessory zip pocket with an internal organization sleeve to stash smaller items. Bungee cords crisscross across this pack's face to provide a stellar spot to loop in a rain jacket, or wiffle ball bat. The North Face Jester daypack totes books, binders and school supplies or essential gear for an outdoor day on the trail. Perfect for day hikes or long treks to class. Big enough to fit all of your books and binders, without the backstrain! The North Face uses injection-molded shoulder straps and a stitched foam back panel for a perfect women specific fit. Designed with simplicity and the female form in mind, the North Face Jester has one large main compartment for bulky gear and a smaller front pocket for organization. It's no joke. The Jester, has a wide range of colors, is a favorite year after year for its large main compartment, removable hipbelt and versatile pockets. Lots of simple storage space to hold all sorts of tools from being a school pack to biking around town. 22 people have already set their own price. I bought this bag to replace my one-shoulder bag that I mainly use to carry books to class. I figured this would be better for my back and more comfortable, as well as double use for any day trips I plan. It's surprisingly roomy and holds all of my books and necessities, and it doesn't put too much pressure on my body despite how heavy of a load it can carry. The padding along the back takes a bit of getting used to, but it's in no way uncomfortable. I'd definitely recommend this for students and day trippers alike! This is a good backpack to carry around campus with a few books and laptop. It's smaller than i anticipated but works fine. The max capacity I can carry is my Macbook 13 in, 2 textbooks and small file folders. I don't carry binders because it won't fit if I carry that other stuff. It's not too comfortable because the back has no padding but it does even distribute the weight on my shoulders. For the price I say its a good deal. I love the way the black one looks. Don't need to worry about dirt being noticed. I purchased this for my granddaughter for this year's back-to-school. She loved it. That is all that matters. As always, Zappos got it to me lickity split. I love Zappos and their awesome customer service. Great backpack. Fits a ton and is not bulky at all. Also the straps are very strong. Well worth the money, very pleased with this purchase. This ctually looks pretty grey. Good quality and design. No inner layer for laptops is not cool. Worth every penny, great quality, lots of storage and very durable, very satisfied with this purchase.